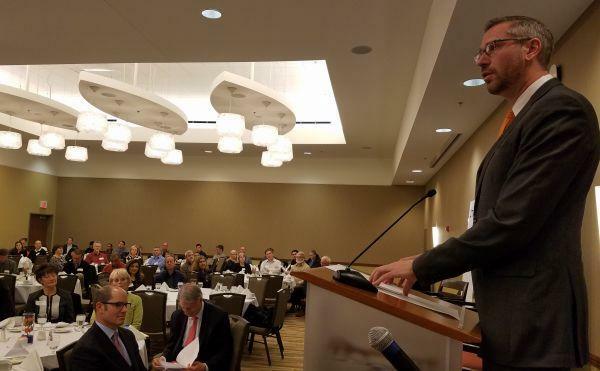 State Treasurer Mike Frerichs speaks to an audience gathered for a panel on saving for retirement at the University of Illinois I-Hotel. Frerichs discussed the Secure Choice program Wednesday at a panel on retirement savings at the University of Illinois. He says right now, the program is signing up employers who want to join the program early. Their employees will start seeing deductions from their paychecks this summer, unless they choose to opt out. Secure Choice will expand to cover other Illinois employers with 25 workers or more starting this fall and continue through next year.